From Tokyo take the Shuto Expressway, the Higashi Kanto Expressway, and the Keiyo Expressway to the Tateyama Expressway. Exit the Tateyama Expressway at the Ichihara exit. Take Highway 297 through Ushiku and Otaki to Katsuura. From there take Highway 128 to Kominato. 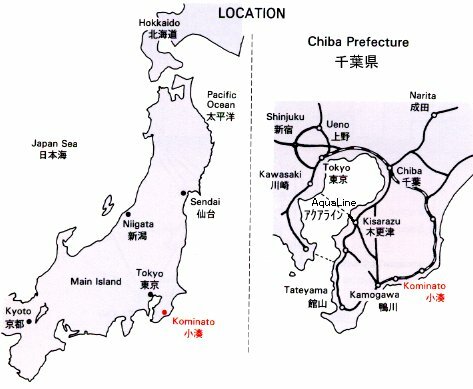 From Tokyo take the Shuto Expressway, the Higashi Kanto Expressway, and the Keiyo Expressway to the Tateyama Expressway. Exit the Tateyama Expressway at the Kisarazu-North exit. Take Highway 409 to Highway 410. Take Highway 410 south through Kururi to the Boso Skyline Drive. Continue on to the Kamogawa Toll Road and then to Kamogawa. From Kamogawa take Highway 128 to Kominato. From Tokyo take the Yokohama-Yokosuka Expressway to Kurihama. From there take the Tokyo Bay Ferry to Kanaya. From Kanaya take Highway 127 to Tateyama. From Tateyama take Highway 128 through Kamogawa to Kominato. From Tokyo Station take the JR Limited Express Wakashio (Sotobo Line) to Awakominato Station (about a 2 hour trip). From there take a taxi to the temple (about a 10 minute ride).